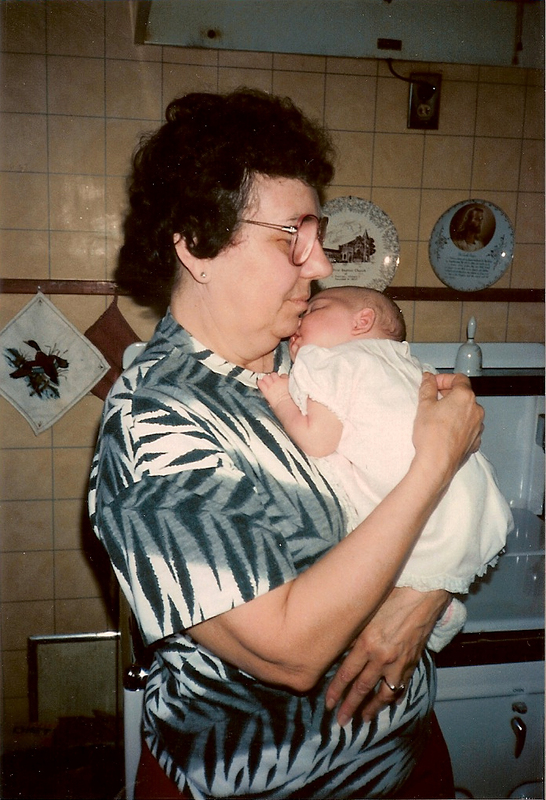 Snuggles with my grandmother in 1989. On Sunday I took a nap with my grandmother and we had a heart-to-heart. I haven’t taken a nap with her for years and years… since I was a little girl who didn’t recognize the importance of such moments. With cancer wreaking havoc on her 78 year old body, I’m trying to memorize every moment with her. I’m just afraid she doesn’t have a really long time left on this earth (but, then again, how do we know any of us do?). The reality of her shortening time with me hit home real hard Sunday when I went upstairs to grab a new book and ended up laying beside her in bed. I know it will be one of my most treasured memories with her. We talked of heaven and how exciting it will be. Of eating without thinking of calories. “For a believer,” I added. I’m so thankful for Grandmama Jean and for the opportunity, though painful for both of us, to see her finish well. To watch her praise God though cancer is tightening its grip on her is a testimony to God’s work in her life and just how far He has brought her. I wish my sister could be here in Colorado with us. She has always been Grandmama’s pride and joy and I know she aches to spend quality time with her before she reaches her heavenly home. I’m praying she gets to do just that before all we’re left with are memories. But oh what great memories they will be. 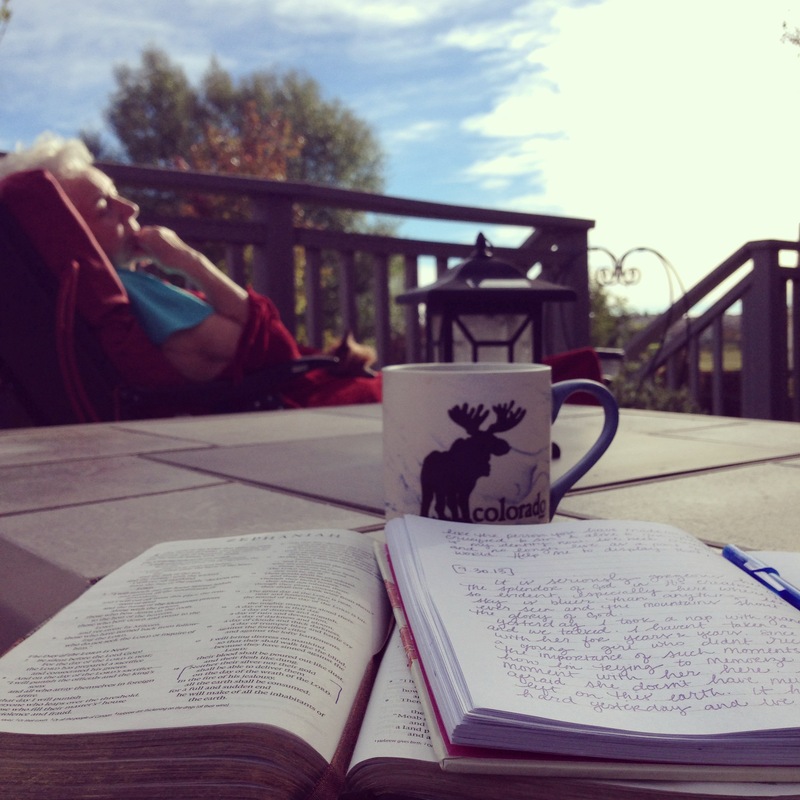 Yesterday morning: spending time with God and my grandmother. Such a precious time. This entry was posted in Uncategorized. Tagged death, grandmother, heaven, hope, love, memories, treasured memories. Previous Post Previous post: Monday Morning Munch No. 57 – Are we like Israel or Levi? I wish I was there too. I miss her so much. I havent wanted to intrude on her rest, or healing, not knowing what is right or would be hurting her is a hard place. I love her so much. She is my pride and joy of a grandmother. I hate time. I hate sin. I hate cancer. Im so thankful for Christ and our hope that surpasses all of them. Great article Sophie! After losing my dad suddenly 2 year ago to cancer, it opened my eyes to how precious time is with family and friends………Time is the best gift you can give anyone! Enjoy each day with her that God gives you all. Praying for you all! love you! You’re so right… life is definitely a vapor. Thanks for your sweet comment. Love you! I miss you too, little baby! Can’t wait for next week to see you! so sweet. lord, preserve us like grandmama jean! Exactly my prayer, Hannah! Miss you! “We talked of heaven and how exciting it will be. Of uncorrupted taste buds.” I am so happy to have found your blog today. Praying for you as you grieve and cherish. This topic is near and dear to my hearts. She will soon feast extravagantly on and with Jesus. Katie, thank you so much for taking the time to comment. That last sentence made me cry all over again–what a glorious thought. The feast we were all made for will soon be hers.